A Palace at the Price of a 2 Bedroom House in Mayfair?! So which do you think is cheaper – a seventy four room palace in Italy or a two bedroom flat in Mayfair, London? Well – the answer is likely to surprise you. The mansion in question is a historic palace used as headquarters by Napoleon Bonaparte during the battle of Marengo in eighteen hundred. The massive Villa la Voglina is an eighteenth century architectural gem, by renowned baroque architect Fillipo Juvarra. 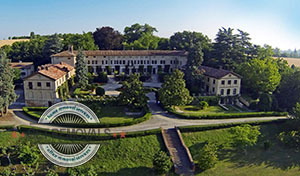 The villa and surrounding land occupies sixty acres of Piedmont in Italy. The house itself features thirteen bedrooms, nine bathrooms, and a private chapel with a thirty people seating capacity. There is more – the villa has two large dining rooms, two kitchens, a set of ten reception rooms and guest house. Outside, the villa comes with its own landscaped gardens, and watch out – its very own vineyard capable of producing one hundred thousand bottles of wine per annum (when restored). Currently the place is up for sale with a London estate agency based in Mayfair. The asking price for the villa is three point eight million pounds – basically the same as a two bedroom penthouse in Eaton Square, London (the property exampled being actually for sale with the same Mayfair real estate agent). Overall, the villa is still cheaper to buy than the place in Mayfair, believe it or not. So what’s happening? Dramatic increase in house prices in London, that’s what’s happening. In the period twenty thirteen – May, twenty fourteen, residential properties in the British capital saw a decent hike in cost and value – over twenty percent in twelve months. During the second half of twenty fourteen, the house market in London sort of calmed down a little. Having said this, central parts of London are now amongst the most expensive residential districts on the planet. Some people might be asking why a historic Italian villa is being marketed through a Mayfair estate agent. Well, the answer is short and sweet – because of the domestic and foreign wealth accumulated and concentrated in London. Furthermore, the current exchange rate between Pounds and Euro is favouring UK buyers, especially when looking to purchase property in central Europe like Italy for example. Another important thing to factor in is that the same favourable exchange rate allows UK buyers to secure highly significant historic properties like La Voglina. So what makes this villa so special and attractive to international buyers? In the year eighteen hundred, the Austrians suffered a big loss – the Battle of Piedmont, Italy. The French overcame the surprise Austrian attack, and within one day the Austrian army was driven out of Italy altogether, solidifying Napoleon’s political stance in Italy. Feeling glorious, and at the pinnacle of his power, Napoleon ordered for the captured Austrian troops to build him the villa. The magnificent features of the villa, like the marble staircases, the terraces etc. are still gracing its looks today. Villa la Voglina is a beautiful example of classic Italian villa of both historic and architectural significance by Fillipo Juavarra. The region attracts many wealthy nationals and foreigners so the villa is unlikely to stay on the market for too long.